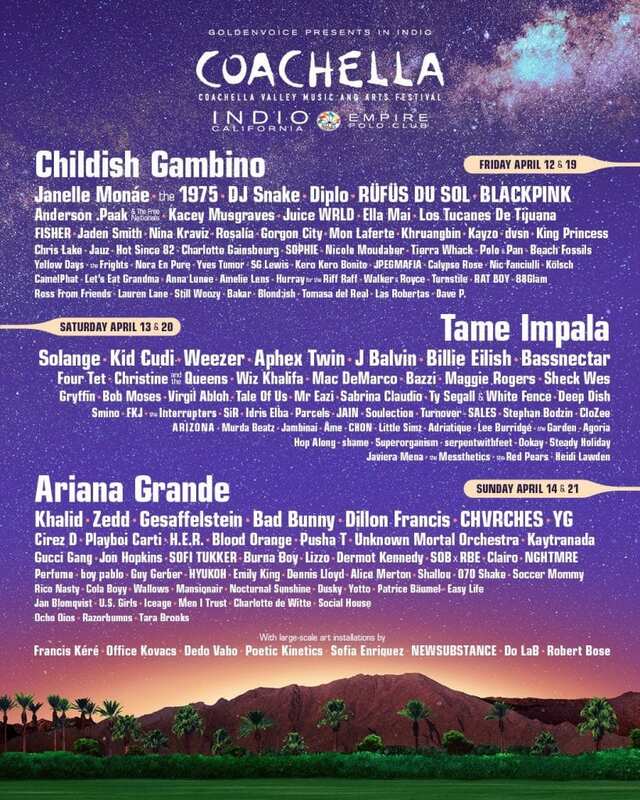 Coachella Valley Music and Arts Festival, one of the largest music festivals in the country, has revealed its 2019 lineup, featuring headlining artists Childish Gambino, Ariana Grande, and Tame Impala. The 20th anniversary of the fest, which runs from April 12 to 14 and 19 to 21, will take place in the desert land of Indio, California. Across eight stages, some of the top-selling artists in the industry will take the stage, followed by up-and-coming musicians. Childish Gambino, who just dropped “This Is America” in 2018, will be joined by Janelle Monae, the 1975, and DJ Snake on Friday April 12 and 19. Kacey Musgraves, the rising country-pop star stealing hearts with Golden Hour, will make an appearance, as well as Anderson .Paak, Ella Mai, and Nina Kraviz. Indie-rock will take over Saturday April 13 and 20 as Tame Impala headlines the day. Weezer, ARIZONA, Bassnectar, Mac DeMarco, and K-pop’s BLACKPINK are among the acts to look out for, as well as Maggie Rogers, who was just featured on SNL for her hit single “Light On.” Billie Eilish, one of the most unique and alluring young artists on the rise, has also scored a performance. Both weekends will wrap-up on Sunday with popstar Ariana Grande, who despite the recent downfalls, has amassed great achievement in 2018 with smash-hit songs “no tears left to cry,” “God is a woman,” and “thank u, next.” Khalid, Zedd, Bad Bunny, Dillon Francis, Chvrches, H.E.R., and Gesaffelstein are slated to perform, along with underground artists like singer-songwriter Soccer Mommy and indie-rock’s Wallows. While pop, rock, indie, and EDM artists will take over the festival, hip-hop is still prevalent; Juice WRLD will steal the mic on Friday, Wiz Khalifa is set to rock the stage on Saturday, and Playboi Carti is due to perform Sunday. Pusha T, who is still touring in support of 2018’s Daytona, will make an appearance, along with Jaden Smith, known for 2017’s “Icon.” Rico Nasty, the rising female rapper from D.C., is also an act to look out for, following the release of her fourth mixtape, Nasty. Aside from the music, Coachella offers a variety of activities and games to participate in throughout the weekend, along with various art studios and pop-up shops. In honor of Record Store Day, vintage and new vinyl will be on sale and a vintage market will offer recycled, retro pieces. A ferris wheel, known as a staple of Coachella, is centered in the festival’s grounds, offering the best desert views. General admission passes for each weekend, general admission + shuttle passes, and VIP passes are available. Camping options and travel packages are also up-for-grabs.